Whether you are an experienced shooter or a beginner, Lady Clay Shooters welcomes you to become a part of our great local organization of women, run by women for women! Our goal is to provide opportunities for women to enjoy camaraderie and the outdoor experience of the shooting sports while supporting local charities. Lady Clay Shooters, Inc. is a 501(c)(3) Tax Exempt organization that provides opportunities for women to enjoy camaraderie and the outdoor experience of the shooting sports while supporting local charities. In many places in the surrounding Houston area, if you listen closely and are standing in just the right place, it is not uncommon to hear shotguns popping in the air. For some, it is music to their ears. More and more men and women are joining the popular sport of clay shooting. Some of the more experienced shooters compete in registered target events sponsored by NSCA. Others prefer to shoot in non-profit charity events. In either case, these tournaments are a great way to test your skills and support the charities of your choice, while enjoying the crisp morning air or a sunny afternoon away from work. The number of charities using sporting clays as their primary fundraising event is becoming a trend. Ladies participating in and winning these events is trending too. Shotgunning is currently one of the fastest growing sports for females in the United States. Truth be told, many women love shooting their shotguns! So where can women in the Houston area go to learn the necessary skills and safety requirements for shooting clays? Many turn to the Lady Clay Shooters, a local organization run by women, for women. Lady Clay Shooters was established in 2012, and for five generations they and their predecessors have been familiarizing Houston area women with the organized sport of clay shooting and hooking them on it! 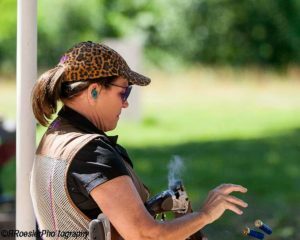 Lady Clay Shooters provides opportunities for women of all skill levels and walks of life to participate in the shooting sports. Instruction in shooting and safety are presented in a non-threatening way, which encourages women to learn the sport and develop a life-long love of shooting. Regular events such as the All Ladies Annual Charity Shoot (benefiting Be An Angel), spring and summer leagues, The Tour de Clays, and the Boo-Stacular Halloween Shoot keep the ladies connected and blasting clays. While the majority of organized shoots hosted by the organization are ladies only, some of the events are co-ed including the much anticipated Couples Shoot that accompanies the annual charity shoot and the Boo-Stacular Halloween Shoot. Many of the women have become close friends and can often be seen out practicing shots, working on skills, and shooting in both competitive and charity shoots. Often the women will start off thinking that this is just a fun way to hang out with other ladies and try something new, but then they go on to joining the NSCA/TSCA (National Sporting Clays Association/Texas Sporting Clays Association) where they shoot competitively. 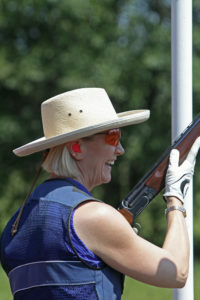 Lady Clay Shooters is an inviting and approachable group of ladies. If you are a novice or an experienced shooter, new to town or have been here a while, there is a place for you. 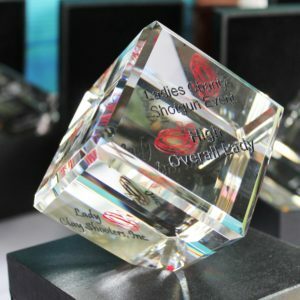 Lady Clay Shooters is dedicated to the work they do and the shots they make, all while having fun and connecting to others.